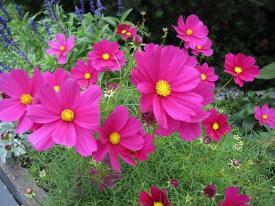 Cosmos are easy-to-grow summer annuals, noted for their bright colors and long bloom period. They require very little care and are an easy flower to naturalize in the garden. Cosmos, also known as Mexican aster, have a profuse number of two-inch aster-like blossoms that are available in a range of colors. There are two types commonly grown, which are similar in appearance except for their foliage. 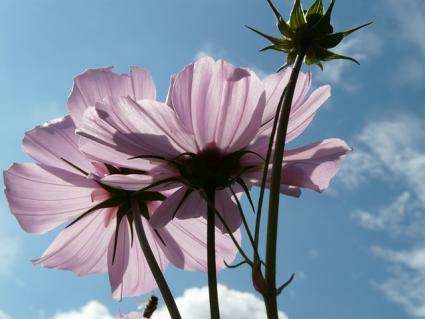 Both types of cosmos are erect plants that can grow up to six feet tall though there are many dwarf forms available. Cosmos bipinnatus is the more common of the two and has thin, airy thread-like leaves. It is available in white, pink, purple, and red, including cultivars with many pastel variations on those colors. Cosmos sulphureus has leaves that are more broad and substantial, though they too are finely cut and divided, bearing some resemblance to marigolds, to which they are related. It is found in shades of warm colors only, such as yellow, orange, and red. Cosmos is useful in the back of annual beds or as seasonal filler in perennial borders. Its self-seeding habit also makes it a good candidate for informal meadow plantings. Cosmos needs full sun and thrives in hot weather. It is not picky about soil and is actually one of those plants that is healthier and flowers more when planted in lean soil (as long it is well-drained). Cosmos also has very low water requirements and once established can go several weeks without rain or irrigation before it starts to suffer. 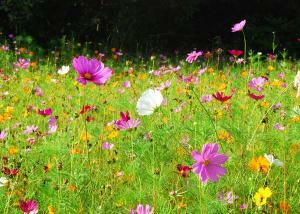 Cosmos are easy to grow from seed though they are also widely available as bedding plants in spring. Start the seed indoors six to eight weeks before the average date of last frost or wait until the cool weather of early spring has ended and plant them directly in the garden where they are to grow. The seed is small and only needs a thin layer of soil covering it to germinate. 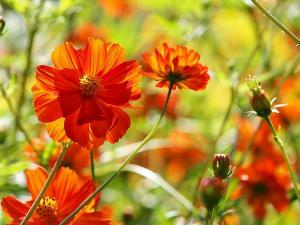 Cosmos will start blooming in early summer and can be cut back 30 percent about every six weeks to keep the plants blooming. Cutting back cosmos also keeps the plants compact and bushy. Otherwise, they can get tall and lanky and have a tendency to fall over - especially the full-size varieties. If necessary, use stakes to keep cosmos upright. 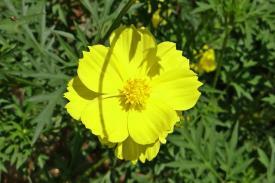 Cosmos is an extremely robust plant that is virtually never affected by pests or disease. Both cosmos seeds and transplants are easy to find in garden centers. As annuals, they can be grown in all zones. Here is a sampling of common varieties. 'Ladybird' series has semi-double flowers in red, yellow and orange on dwarf 15-inch plants. 'Polidor' has yellow-tinged orange flowers and grows to about 30 inches tall. 'Candy Stripe' has white flowers with red stripes along the petals. 'Daydream' has pink petals with yellow centers. 'Cosmic' series includes 12-inch tall dwarf varieties with yellow and orange flower. Some plants are sought for their beauty, some for how easy they are to grow. 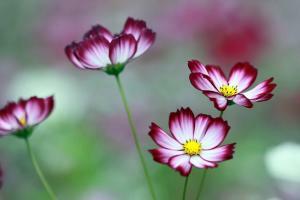 Cosmos is known for both and because it re-seeds so easily, once you've planted it will come back year after year.